Where are the Hatching-tide hidden egg locations in Final Fantasy XIV? Easter has descended on Square Enix’s famously resurgent MMO and we’re all celebrating by solving some devious egg-based puzzles. At least you can get your brain working before you inflict a chocolate-induced coma on yourself. As ever, we’re here to help so you can unlock the plush new Spriggan armour set. This is a seasonal event, so you only have a limited amount of time to complete the new set of quests: Eggstreme Eggstrapolation, A Shelltered Eggsistence, and Deus Eggs Machina. However, you need to be at least level 15 to tackle them, and you only have until April 22 at 2:59pm GMT (9:59am ET / 6:59 PT) until they’re gone for good. And that’s no yoke. Honestly, if you didn’t appreciate that pun, perhaps this set of objectives isn’t for you – Hatching-tide is full of them. Jihli Aliapoh is in trouble, and you’re just the hero with the penchant for scavenging she needs. 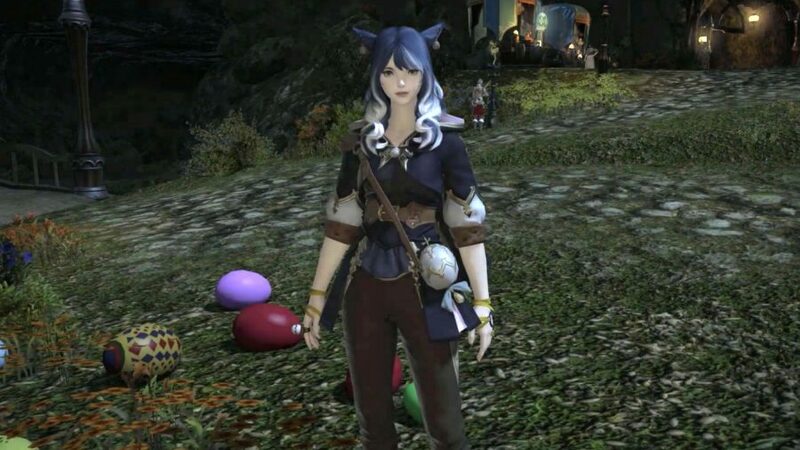 She needs your help with finding a series of FFXIV Hatching-tide hidden eggs snaffled away by the mischievous Nonotta and Riggy. You can find your troubled quest-giver in Old Gridania: her coordinates are X:10.2, Y:9.4. So, now that you’re ready, here are the Final Fantasy XIV Hatching-tide hidden egg locations. Nonotta and Riggy’s puzzle is a toughie, so it’s understandable if you feel a bit stumped when she hands you a rather confounding set of maps. The scattered mix of letters all over the map doesn’t reveal all that much to get you started, until you speak to some spriggans. They’re near to Nonotta and you’ll find them marked on your minimap before hunting for each egg. Each spriggan gives you a clue that corresponds to the map, but these are the only hints Nonotta is willing to give. Once you’ve said the password to Gabineaux you’ll have completed the Deus Eggs Machina quest and successfully discovered all the FFXIV Hatching-tide puzzle solutions. That, of course gives you the full Spriggan armour set. Oh and, if you’re a clumsy soul and you’ve lost the jacket somewhere while completing the quests, you can buy it back at the event shop. And there you go, that’s where to find all the Hatching-tide hidden eggs in Final Fantasy XIV. If you’re looking for more information on the new jobs coming to the game as part of its third major expansion, Shadowbringers, then here’s what we know about the upcoming Final Fantasy XIV Gunbreaker job. And, naturally, we have a list of the best MMOs on PC if you’re looking for more massively multiplayer fun times to have with your mates. In the meantime, we hope you enjoy your new set of threads. Just try not to get chocolate on it, it’s just a waste and that stuff stains.